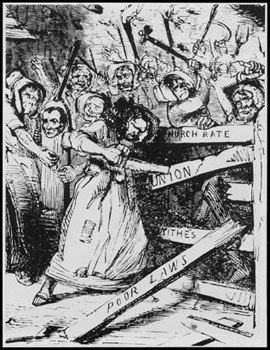 The Rebecca Riots were a phenomenon which occurred in the rural parts of West Wales from 1839 to 1843. As the riots progressed, knowledge of them spread throughout the rest of Wales and affected Radnorshire, particularly in the Rhayader area and to a lesser extent in Glasbury-on-Wye. The riots occurred mainly because of the dreadful state of the existing roads, the many high road tolls which were being imposed and the increasing tithes demanded by the Church at this time. These grievances were compounded by the lack of good governance of the Poor Law by the parishes concerned. ‘Mother Rebecca’, the ring leader, was usually dressed as a women and often carried a firearm; whilst his ‘Daughters’ were dressed in a rag bag of costumes, sometimes with blackened faces and wielded an assortment of weapons such as pitchforks, cudgels, hammers, staves etc. The rioters were well organised and operated at night in large groups, of up to 200 on occasion, and would have been a terrifying force to contend with. Their intention was to destroy the toll gates and intimidate the gatekeepers and the owners, yet throughout the whole campaign there was only one recorded tragic incident, when a female gatekeeper was shot and died on one of these nightly confrontations. There was however a heavy price for some of the rioters; namely the ones who were caught and deported to Australia. As the riots continued and spread the Gentry responded by calling in outside help in the form of extra police and eventually the military. A sensible compromise was called for and a Commission of Inquiry recommended that each S Wales county should have one body which would be responsible for the management of the turnpike roads. The eventual outcome was the South Wales Turnpike Trust Amendment Act of 1844 and led to a reduction in the number of gates and a uniform system of tolls throughout the region, although some years were to pass before the roads became improved to a significant level. On Monday night last, the gate situate in the village of Glasbury, on the Radnorshire side of the river Wye, was removed from its position, the posts sawn off about 18 inches above ground, and the gate thrown into the river, after having been sawn in two, and so far mutilated that it will be of no further service. It appears that only three individuals were employed at the work, who were seen by the aged female who collects the toll, and advised her to keep quiet, as they would not injure her; but it is said that upwards of fifty persons were close at hand. Having completed their job, and given three cheers, they marched off through the village in the direction of the Woodlands, towards the hills lying above that place, shouting “Becca forever,” and discharging fire-arms; some of the inhabitants hearing the noise arose to see what occasioned it, but could not recognise any of the party. It appears the road on which the gate was placed is repaired by the parish of Glasbury, and a petition very numerously signed by the inhabitants, and those of the adjoining parishes, was some time past presented to the Radnorshire Turnpike Trust, to remove the said gate, but it was never done. The toll board has also been taken down; there were two gates adjoining the toll-house, the one in the road leading into the village, which is destroyed, and the other in the road leading to Clirow and Rhydspence, which was not molested, as they consider it a turnpike-road. No clue has been obtained as to who were the perpetrators of this lawless act, although a reward of 50l. has been offered by the Magistrates acting in the hundred of Paincastle, on conviction of the party or parties by whom it was committed. A chain is erected on the spot, and the regular tolls taken, as if nothing had occurred.?—? Silurian. When the Maesllwch Gate had been replaced by a chain, four special constables were employed to guard the gate at night and were paid 18 shillings a week. However in January 1844 the Radnorshire Trust decided that the gate should be removed completely and accordingly scrapped the chain and withdrew the police guard.